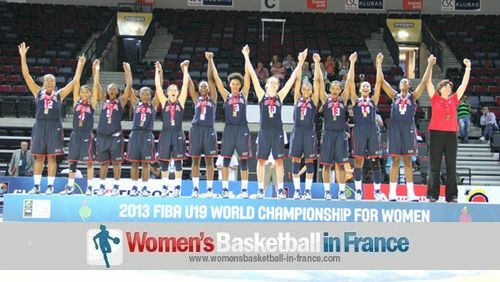 The 2013 FIBA U19 World Championship for Women in Klaipeda has come to an end with the USA picking up the gold medal with a victory over France (61-28). The bronze medal went to Australia who defeated Spain (73-68). In the other consolation games, China beat Brazil (68-65) while Canada ended their World Championship on a positive note to claim 7th place in an entertaining game against Japan (75-64). 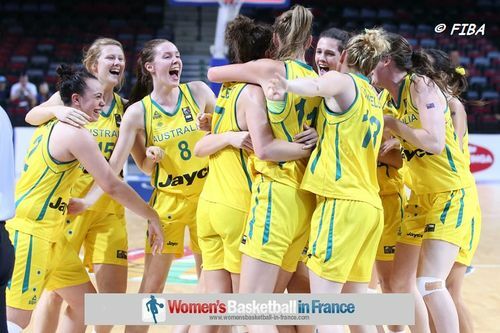 Australia made up a 14-point first half deficit to beat Spain (73-68) for their first championship medal since 1997. 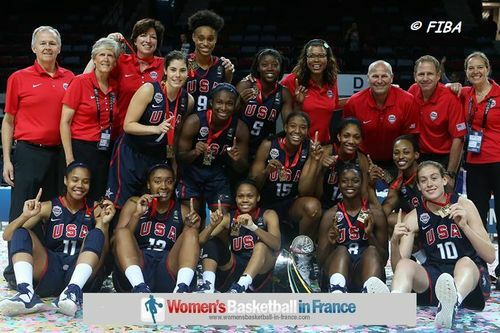 The USA won their fifth successive World Championship title and sixth in their history after blowing away France (61-28) in the final. France lost Olivia Epoupa on the 27-minute mark and scored afterwards just 2 points the rest of way. 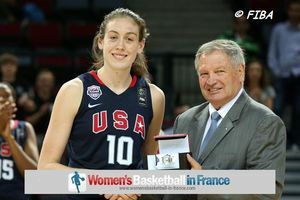 Breanna Stewart who also won the award of MVP led the USA with 16 points and 9 rebounds. 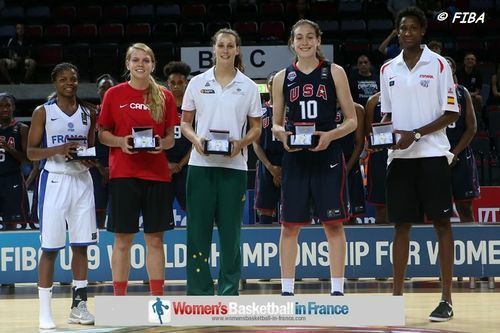 The all tournament team is: Olivia Epoupa (France), Jamie Weisner (Canada), Stephanie Talbot (Australia), Breanna Stewart (USA) and Astou Ndour (Spain). The game started with a balanced opening with neither team having control although the USA led (8-6) after five minutes. 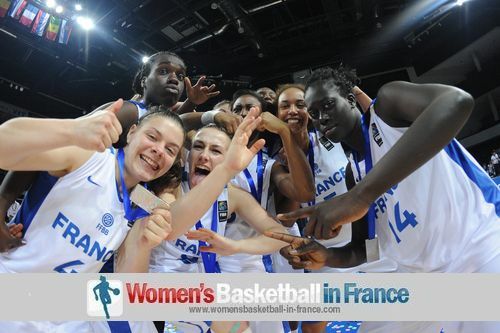 France found things difficult from the moment Clarince Djaldi-Tabdi went off the court with 2 fouls. Then the USA spread the French defensive and forced Jérôme Fournier to call a time-out with three minutes to play in the quarter after Breanna Stewart knocked down a three-pointer (6-13). France just could not score and the USA were able to finish the first quarter with a 9-point advantage (17-8). The first five minutes of the second quarter was very defensive with the USA having the upper hand and Stewart leading the way (24-12). The French coaching staff had no choice but to call a time-out as they needed to find a way to get Olivia Epoupa into the game offensively. Epoupa was moved to the wing and knocked down a three-pointer to end a three-minute barren spell. 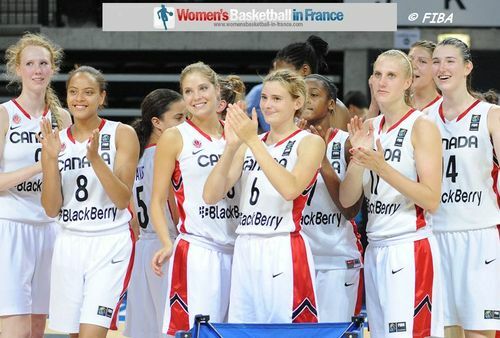 Epoupa scored the next 4 points for France while the offensive machine of the USA took a break. Yet the American team still went into the locker room ahead (27-20). Stewart and Epoupa both had 9 points at half time. The USA kept it simple and played quick fast break basketball and started to run away with the game (37-24) midway through the third quarter. It got worse for France with Epoupa having to leave the game injured on the 27-minute mark. France did not score again while their opponents had the last 8 points of the quarter for a 21-point lead (47-26). It was one-way traffic with the USA completing a 20-0 run before France got on the scoreboard again through Marième Badiane, almost ten minutes after their last basket (28-57). 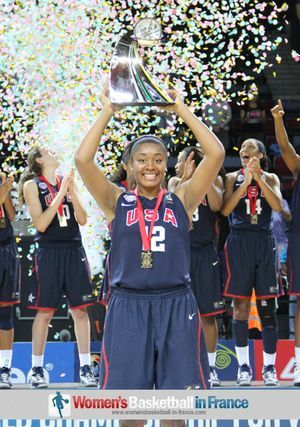 The USA completed the job (61-28) for their 5th consecutive FIBA U19 World Championship for Women title. Australia made up a 14-point half-time deficit to beat Spain (73-68) in the 3rd place match. Carley Mijovic and Stephanie Talbot finished with 25 and 22 points respectively for the Gems. 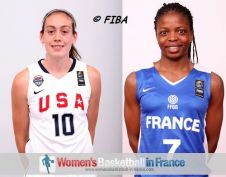 Spain were led by Leticia Romero and Astou Ndour (10 rebounds) with 16 and 14 points each. There was also plenty of drama in the fifth place match in which China blew a 15-point lead but still managed to pull off the win against Brazil (68-65). China had four players in double digits while Brazil were led by Isabela Ramona with 23 points. Emma Wolfram (12 points) put Canada in front for good against Japan on the five-minute mark (12-10) in the first game of the day. The rest of the match was not pretty with a lot of wayward shooting. Canada dominated the rebounding with a total of 69 as they paced themselves to victory (75-64). Jamie Wiesner finished the game with 20 points while Quinn Dornstauder added 14 points. For Japan Miyuki Kawamura finished with 18 points.